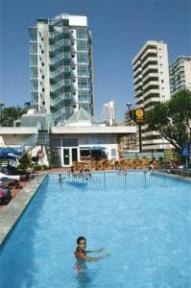 Privileged situation in the heart of Benidorm, close to the best entertainment and commercial area, 200 Mt. from the Levante beach. Hotel offers swimming pool for adults with children section, solarium with sun beds and parasols. Evening entertainment with live music and dancing every day, also live shows several times per week. Complemented with a small library, TV salon, bar-cafeteria, self-service restaurant, hair-dressers with beauty salon .Garage.